It turns out that 35% of college graduates have an advanced degree. (You didn’t know that, did you? I didn’t). That’s up from 32.7% in 1999 (these figures are for workers 25 and over). That seems pretty good, doesn’t it? More and more of our college grads are getting advanced degrees, which is exactly what we would want to help foster innovation. But then I asked a second question: What percentage of U.S. college grads have a doctoral degree? That is, what percentage of them have a research-oriented education? The answer was not so pleasant. 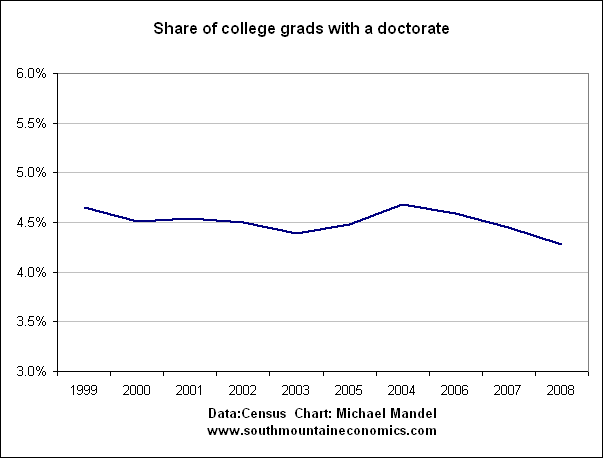 In fact, the share of college grads with a doctorate has fallen over the past decade. Not by much, for sure—but there’s no sense of a PhD being a desirable degree. Americans are not flocking to spend 4-6 years writing a dissertation and going on to research. And why not? This chart, which shows the change in real pay since 1999 for higher ed graduates, may help explain the relative undesirability of the PhD. Yowza! 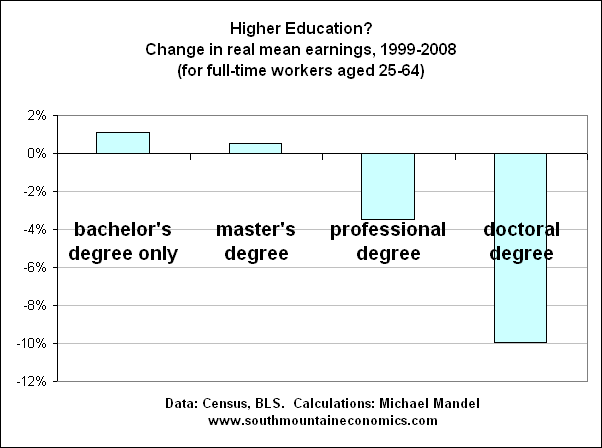 The real earnings for full-time workers with a doctoral degree has dropped by 10% since 1999. That’s not what you would expect in an innovation-driven economy. I’m sure the continued reduction in funding and doctoral student research grants also plays a telling part. …It’s the double-whammy of lost income during the years at school and pithy funding that doesn’t even keep grad students above the poverty line. Obama needs to tackle these issues if the desire for an innovation economy is ever to be realized. It would be interesting to compare those statistics with change in cost for the degrees, change in admission standards, and change in employment opportunities. So what is the composition of the Ph.ds? Art, engineering, science, philosophy and how did each segment do? Science and engineering Ph.Ds seem like a good bet, still, if only to produce the persistence that one’s startup will appreciate. Oddly enough, these are popular with immigrants more than born-Americans. As NVCA finds, (http://www.nvca.org/index.php?option=com_docman&task=doc_download&gid=331&ItemId=93)”American Made”, >40% of high-tech firms are founded by the 8% of legal immigrants in the populace. I wonder how valid the original premise is — that advanced degrees drive innovation. I’m not saying they don’t, but it seems in Silicon Valley at least that advanced degrees are not a prerequisite for innovative ideas (Bill Gates, Steve Jobs are only the most prominent examples). If I recall earlier data correctly, this is an extreme reversal since 2007 for the highly educated, corresponding to noted abandoning of R&D investment during the recession. Ann, I share your curiosity regarding the impact on the cost of higher education, since competition with private sector salaries has been used as a major excuse for tuition escalation. 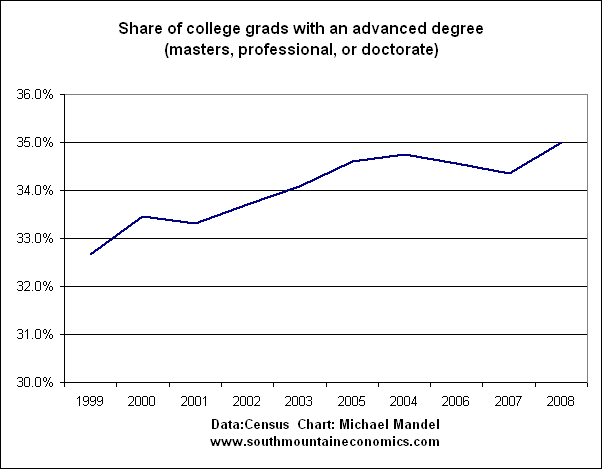 The surprising growth in advanced degrees could have been a contributor. I don’t think you can pin these trends on a “noted abandoning of R&D investment during the recession”. Data from NSF shows a real increase in US R&D performance of 23% from 1999 and 2007 (their last data point). R&D in US business grew 19% in real terms and R&D in US colleges and universities grew 42% (!!!) in real terms over that period. All the data and anecdotes I’ve read indicate at worst a small decline in R&D investment in 2008 and 2009 resulting from the recession. While some businesses did tighten R&D budgets, Federal R&D investment got a boost from the stimulus package (Energy and NSF were big winners). I am less well-versed in the demographic side of things, but I suspect the decline in real wages of PhD holders has to do with the tenure system in US universities and the growth in the number of post-doctoral appoints (aka nerd slave labor). Unless you have some inside information, the jury is still out on domestic business R&D spending in 2009, especially given what is going on in the auto industry. We do know that there’s been cuts in scientists and engineers (see my last cover story at BusinessWeek), despite the federal stimulus. I suspect that the drop may be bigger than many expect. Sorry – no inside info here. I based my statements off of the latest Batelle/R&D Magazine forecast (they estimate a 3.8% decline in US R&D spend in 09) and what I’ve seen in 10-Qs/press releases. I guess my feeling is that even if the drop in 2009 is larger than many expect, I find it unlikely to wipe out the tremendous growth of the previous 10 years. Fingers crossed! Your point about the auto industry is well taken, but it is incredibly difficult to gauge what is going on there based on public records (Ford no longer breaks out it’s R&D spend in its financials, and GM and Chysler are essentially black boxes at this point). The one thing I do know is that Ford has received loan guarantees of $5.9 billion from DOE as part of the ATVM loan program. Coming back to your original post, I’m still unsure how much of an impact these R&D spending trends have on the real wages of PhDs – at least not in the academic sector. The problem is your premise that graduate education has anything to do with innovation. Considering most education is simply rote regurgitation of known principles, with a whole bunch of fluff thrown in to waste more of the student’s money, it should be obvious that’s not the case. If anything the coming death of most education institutions- guess who’s next to take a bullet after newspapers and magazines?- will spur a lot more innovation. It may be that the relation between innovation and formal education is soversold, but given today’s accreditation and hiring practices, a strong correlation still exists between the number of people employed with higher degrees and the amount of money spent on research and development. Many of the more innovative ideas still require a big R&D investment to make into a reality. The relationship between innovation and formal education is not just oversold, it’s practically nonexistent. Yes, PhDs are hired when R&D money is spent, but how much of that R&D money then pays off? Microsoft has been spending billions for years, can you point to anything that came out of it? The problem with current education systems generally, and PhDs specifically, is that they’re geared for regurgitating facts, not reason. That environment is not conducive to innovative thinkers and to be fair, that’s not a goal of education anyway: the goal is to steal a bunch of money for the education bureaucracy, all while producing people who can spout off some minimum set of facts. What’s laughable is that people then assume that education is responsible for innovation, classic cargo cult thinking. 🙂 A few innovative ideas in biotech or hardware may require big investments but we’re on the cusp of the information age and what’s needed most now is innovative software. With open source and free development tools, that’s easier and cheaper to innovate than ever before, all it takes is your time. It would be interesting to see the breakdown in higher degrees. The growth of the FIRE economy may have bent subject choices away from more productive science and engineering based study. Another interesting line of enquiry might be the socio-economic status of graduates. The middle class is probably taking the biggest hit in the post millennial economy and those taking higher degrees may belong disproportionately to this group. I’m not sure what to make of the last chart. Are you comparing the income of Phds between now and 10 years ago? Or are you comparing the income of Phds vs. those with undergraduate degrees but no graduate degrees? Change in real incomes for PhDs between 1999 and 2008. Though of course, the other chart you mention would look almost identical. I wouldn’t be surprised if a part of it has to do with the growth of the internet. For one, shorter attention spans… but more notably, the power that everyone now has to create their own content, rather than do work that requires real in-depth research and evaluation towards something less instantly gratifying. I think you are picking a weak start date (1999) for your comparison of salaries. the comparison will look better (1997 doctorate salary $62,400). This isn’t surprising. Universities are hiring fewer tenure / tenure track people, a job that requires a Ph.D. and pays an okay salary depending upon the specialty. Instead, they are going with an army of adjunct professors and paying them much less (Ph.D. also typically required for this role). Meanwhile university career centers and grad departments do little or nothing to prepare doctoral students in many fields for a career outside of a university setting, making it much harder for this group to find well-paying employment away from academia. A question regarding the percentage decline in Ph.D.s relative to college graduates — does this represent a real decline in the numbers of Ph.D.s produced? If we are producing more college graduates but the same number of Ph.D. students, then naturally the relative percentage will go down. And this might be more a factor of how expensive Ph.D. education is and how few positions are available. It is a lot easier to add undergraduate students, who generally provide income to the university through tuition, than to add additional Ph.D. positions. My institution pays my full tuition, $28K per year, plus a $6K stipend to me every year, so it costs them over four years $130K+ to educate me. Plus, Ph.D. education is much more labor intensive from a faculty point of view than undergrad — most of it is in the teacher/student ratio range of 1:1 to 1:5, versus much bigger classes for undergrads. As to the comment that Ph.D.’s are all about regurgitating facts, that seems like a fundamental misunderstanding of doctoral education. A dissertation project, by its very nature, must be a new contribution to scholarship. Whether in the humanities or the sciences, no one can do a dissertation that regurgitates something old, it has to be something new. That doesn’t mean it’s necessarily innovative, but it does require an ability to identify where there are gaps in the scholarship and an ability to fill that gap with something new. And that is a lot more difficult than it sounds. On start dates: Everything looks better if you pick 1997, because 1997 and 1998 appear to be real growth years. On the other hand, the usual way of adjusting for business cycles is to measure peak-to-peak, which would be 1999 or 2000 or 2001 (depending on your measure) to 2007 or 2008. Meaningless charts in many ways. Graduates with Phd may be making say, twice as much as someone with a BA, so then a BA would go from say $50,000 to $50,500 (1%) and with a Phd would go from $100,000 to $90,000 (-10%) a year. Roughly a $40,000 difference. Get my point. The actual salary makes a big difference if the net difference in salary is large. In this case the percentage of change would be misleading. If you had a Phd you would have caught this, which is why any of you who think a Phd is a bad deal won’t be making the big bucks. What we seem to be seeing is a labor market that demands more credentials, but offers little real income benefit in return. If 1/3 of college grads have a master’s – how many positions really need that level of education? baconboy, You misread my comment, I didn’t say Ph.D.’s are all about regurgitating facts, I said all education is about regurgitating facts. 🙂 This is exhibited when PhD’s actually go into the workplace and the common complaint is that they’re a bunch of narrow technicians who can’t or won’t do much else. For every one that generalizes or does something innovative, there are 20 who don’t. This is because the specialized research regurgitation that composes most of their education is no better than the undergraduate equivalent, often worse. Bill, if you look at the actual household net worth numbers from the Fed’s Z1 releases, you’d know this was a great decade, despite the charlatan spinning from leftist news media (job growth is an extremely dumb measure of well-being, particularly since it’s rife with measurement problems). I agree that the labor market is broken because it often demands useless bachelor’s, masters or PhD degree credentials but I’m sanguine that the coming rise of online education, that’s about to kill off most colleges, will destroy such stupid credentialism and replace it with better certification processes. Thanks for clarifying Ajay, but now I’m really confused — though that’s probably from all the facts I’m having to remember and regurgitate. Because if I follow your logic, if all education is about regurgitating facts, then wouldn’t everyone be trapped in the same problem, regardless of what level of education they reached? I mean, how in the world would anyone be able to innovate at all? And how did anyone manage to innovate in the first place, if they were only trained to regurgitate facts? Should we only hire people who never went to school? But here’s another question: do we make too much of innovation? Perhaps real innovation is few and far between (kind of like Kuhn’s paradigm shifts) and real progress can be made by slow and steady incremental improvements. Maybe you only need 1 innovator and 20 highly trained experts to make incremental improvements on his/her big breakthrough? For example, it seems to me that what makes Apple so successful is they have one innovative genius at the top (Steve Jobs) and a whole bunch of people underneath him (probably even a few with Ph.D.s!) who make his ideas work. A lot of medical research labs work the same way. In my field (I’m in the humanities), there are a few real innovators and geniuses, but there are still a lot of people who because of their doctoral training still manage to take us forward in our knowledge. I know that without my training I wouldn’t be able to even understand some of the work of those innovators, much less carry it forward. I think you paint with too broad of a brush. Ajay, I’m grateful that you can help me with my reading comprehension, because I apparently just can’t keep up. You see, when you corrected me and said “I said all education is about regurgitating facts” (and even helpfully bolded the ‘all’ so a daft doctoral student like me could understand), I took the ‘all’ to mean more than just college education. I assumed that ‘all’ included k-12, as well as college and beyond, for surely you aren’t suggesting that the regurgitation of facts just magically begins at college? I would never assume that ‘educated’ = ‘college educated’, rather my point is that if all education is limited like this, then high school graduates are no better than 8th grade graduates who are no better than Ph.D.’s. And actually, the jargon specific to my field was the easiest thing to master, it’s the difficult ideas that take time. And while there are plenty of obscurantists, generally I’ve found that there’s a fairly direct correlation between the quality of the thinking and the lucidity of the writing. But even so, most of those ideas require a bit of chewing on in order to fully understand them. Don’t get me wrong, I actually think there are deep problems with undergraduate and some graduate education, but I’ve also taught both levels and have seen real thinking and critical engagement, rather than mere ‘popular convention’ happening. But a problematic higher educational system is not the same thing as one that is ‘useless’. And I’ve definitely seen original thinking and interesting ideas percolate among my fellow doctoral students, but I’ve also seen a few of them who are limited, but that in no way means that their education was wasted, but only that their contributions will be limited. All this crud about innovation. When it comes right down to it, innovation is a relative concept that in my estimation is impossible to quantify in any meaningful way. Movement ahead in most endeavors will occur as information is built upon irrespective of macro level conditions. As commenter ‘Bill’ has already hinted at, we probably see a pricing-in effect of advanced degrees. Where I work (software product division), we have a good many PhDs who essentially fix bugs and do incremental product enhancements. The work they do does require a substantial amount of subject matter skill, but that’s not what they learned in their PhD program. Rather, the preference of (“tech”) employers for PhDs and other advanced credentials is allegedly because somebody completing the degree is ostensible “proof” that they are willing and capable to endure adversity to reach a set goal (I have heard this from enough sources to accept it as fact). A perhaps smaller factor is that managers of “R&D” divisions seem to have high-flying ideas of what the division is doing or would be doing, and what level of expertise/credential doing that takes. The reality of degree holders being asked to do product maintenance belies those ideas. Aside from that, I suspect it has something to do with the supply of PhDs and similar advanced degrees, as a result of relentless credentialism. The last time I heard something quotable and related it was from G.W. Bush, but it wasn’t the first time — the admonition to pursue (higher) education so one doesn’t end up “at the end of a shovel”. My favorite recent example is when Google had a position for a “massage operations coordinator” (who “manages” internal massage appointment lists, sends reminders, and makes sure the masseuse shows up and is paid) they were looking for somebody with any Bachelor degree (preferred but not required in fairness). Does this mean a highschool diploma doesn’t cut it anymore for such occupations? Presumably there are enough college graduates. I saw this posting quoted on the blog of the Chronicle of Higher Education (http://chronicle.com/blogPost/Another-Reason-to-Just-Say-No/20517/). I was hoping that the original posting (here) would show the per capita income of each of these groups, but I was disappointed. The figure above shows that the real salaries of doctoral degree holders are falling. But are they still (or were they ever) higher than the other categories? If so, a Ph.D. may still be an attractive path financially, even if it’s not as attractive as it used to be. Yes, but Ph.D’s still earn much more per year, on average, than those with professional degrees. Shouldn’t this be mentioned? Not true. In 2008, mean earnings for PhD holders was $113,875, while the mean earnings for professional degree holders was $141,307. It’s interesting to see such a huge difference between mean ($141k) and median ($100k) earnings for professional degree holders. This is a much bigger difference than for other degrees. It suggests that the mean earnings of professional degree holders are skewed upward by a relatively small number of very high earners, doesn’t it? The median earnings of Ph.D. holders are only about $8k below professional degree holders — so for most of the people in these populations, earnings are more similar than the means suggest. Yes, the HR term for this phenomenon is “salary/pay compression”. It is observed within organizations and also across occupations. A few thoughts. (1) You need to use median earnings given the way income distribution is skewed to high earners. (2) You get a much more complete picture by adding those without post secondary degrees. A quick look of my own (I could more easily get 2002 data to compare with 2008 – give me some slack it’s early AM) shows that all educational levels lost ground from 2002-2008. However, those without even a HS degree earned only 90% as much in 08 as 02. While BS holders earned almost as much (99%), PhDs still earned 96% of what they did in 2002. Not great, particularly given the money and opportunity cost of earning the degree. However, still much better than HS or non HS degree holders. Lastly, I did not have time to check the increases for the same groups from, say 1992 – 2002 to see which increased the most. Given the rise of “knowledge worker” occupations over the period, particularly in IT, I would not be surprised to see that MS and PhD holders out earned others over that prior period. Ajay is exactly correct. There is a huge bubble in higher education, but the issue has not generally been addressed in the mainstream press. A combination of factors have greatly increased the number of people going to college, professional school, and graduate school: Off-shoring of manufacturing to China, the global market for “knowledge workers”, easy credit from banks, and the global absorption of women into the workforce. Colleges have done a fantastic job of coaxing gullible students, both undergraduate and graduate that going deep into debt in order to go to their overpriced school will insulate them from the realities of supply and demand when it comes to labor. Graduates of professional schools are not immune from the global glut of “knowledge workers”; increasingly graduates from even top law schools are either unemployed or underemployed. In the next two decades, many colleges will close, even many “top” schools as governments will no longer be able to support the school lending market, i.e. Sallie Mae. This includes professional and graduate schools. The combination of online schools and nation-wide/international certification exams will replace most college programs. Programs that require lab-work will not disappear, but the number of such programs will decrease significantly. I looked at a college education as vocational training for a specific profession: computer engineering. To this end, it was effective, if not efficient (much of what I learned I do not generally apply). I was exposed to a large array of problems I didn’t know existed and the means to solve them if I failed on my first independent attempt: great training for problem solving. In most classes, all I needed was the textbook, but I was introduced to some good textbooks, so I can say that my college education gave me the training I needed to get a job I enjoy and work with some smart guys. And some of what I learned actually is directly or indirectly applicable stuff that helps me be competitive in my workplace. In short, I think there’s a lot of value in a good college education if you know what you want out of the experience. I do think that it could have been accomplished in less than 6 years if I had gone to a school that let me cut the stuff that wasn’t applicable to my chosen profession, and that’s where I think there’s some market opportunity. I’ve thought a lot about the median versus mean question with these figures, and I think the means are more informative. That is, if you are making the decision about whether to get a PhD or not, the expected value of your future income is more closely linked to the mean of the earnings distribution than to the median. hence people look for news telecasting media with the time of get together happening in sports. People from all across the globe start their day at these online destinations everyday. Individuals have been vacillating about a unnatural weather change are presently waking up for the certainties. For Internet Marketing, Content Management is next, exactly what do you think. clean infrastructure in 1987, 1988, 1989, 1990, and 1992. When a lot more plus more people today vote on your own articles regarding the communal announcement sites, it becomes additional well-liked. products displayed and then for sale. India is a country that is famous for a lot of languages and religions.